> Home > News > FIFA 17 : I am coming! Are you ready? > FIFA 17 : I am coming! Are you ready? The most exciting moment for football fans worldwide is coming! FIFA 17, the new installment of the FIFA series, is ready to launch in September. With its new features, FIFA 17 promised to be the most exciting football simulator yet. 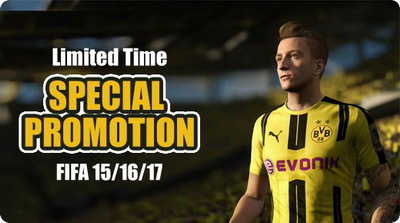 Now, mmosale.com has prepared plenty of gifts for all FIFA fans to celebrate the launch of this must-buy game. -5% OFF on coins of FIFA 15, FIFA 16 &FIFA 17. You can enjoy this discount by clicking on the “football” icon when in shopping cart page. -One chance to get a free-of-charge order every day. The amount of the free-of-charge order will be added to your account in the form of bonuses. - FIFA buyers at our store will have a chance to gain 100% free coins as long as they leave messages on our Facebook or Twitter. -As long as you buy “FIFA 17 CD Key” or “FIFA17-2200 Points”, you can get a 30% OFF coupon code, which can be used to buy FIFA17 coins before October, 23. Facebook and Twitter for more information.